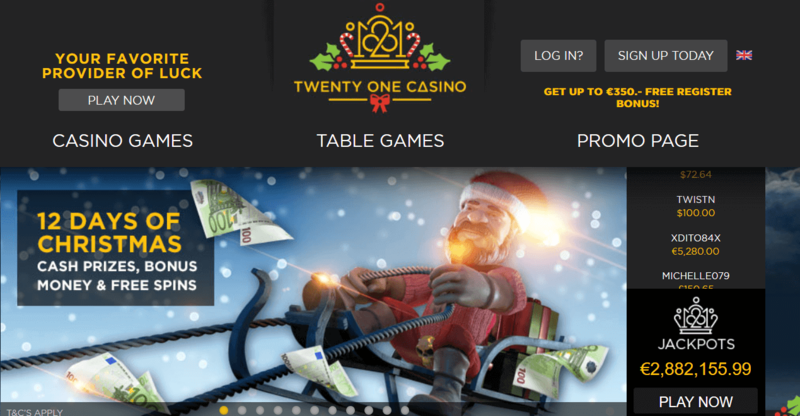 21 Casino, formerly known as TwentyOneCasino, is one of the fastest growing NetEnt Casinos, working hard to deliver its players nothing less than the best casino experience. An enthusiastic and hard-working team makes sure that 21 Casino keeps up with time, enhancing its functions constantly while new casino games are added regularly as well including all the newest NetEnt slots. While renewing and innovative, you can still expect a user-friendly site showing that the people behind this brand aren’t new to the iGaming industry. Experience and expertise can be found throughout the entire desktop platform, mobile casino platform, Live Casino, in its game offer, payment options, customer support, design, and online casino promotions. 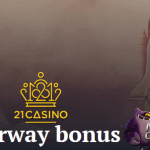 21 Casino is dedicated to both loyal players and new players, offering more and more casino promotions. 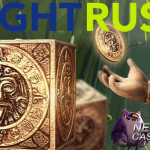 New to this NetEnt Casino, a registration is already enough to activate a first free spins promotion with 21 free spins available. Welcome bonuses, deposit bonuses, reload bonuses, more free spins promotions, and other casino promotions is what you can expect next. This NetEnt Casino is growing fast and was already available in English and in German, but since a short while Finnish and Norwegian players can also enjoy a platform of their own with their own language and currency. All special platforms are fully translated and, therefore, Swedish, German, Finnish, and Norwegian players can look forward to an online casino in their language and in their own currency if available. When offering hundreds of online casino games, you have to make sure your players don’t get lost in a maze. This is why all online casino games at 21 Casino can be found easily as this NetEnt Casino used 13 different categories such as Top Games, New Games, High Rollers, Big Wins and more. 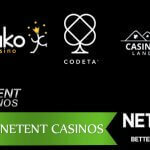 The entire NetEnt Games suite is available at 21 Casino, one of the reasons I decided to add this online casino to the list. Hundreds of NetEnt slots, including the newest releases, can be found at 21 Casino. Since 2015, 21 Casino consistently strived to provide players with a superior gaming experience. Today, they offer a safe space for players to enjoy the very best of what the online casino industry has to offer, in the exciting setting of an avant-garde casino that ticks all the right boxes. No doubt 21 Casino is a generous NetEnt Casino as the fun starts with a No Deposit Free Spins offer. 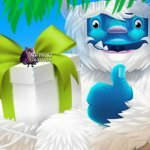 This means that you will receive 21 free spins without a deposit required. Following the three simple steps of registration is all there is for you to do to receive 21 no deposit free spins. 21 Casino is getting more dedicated to their players and their hunger for promotions. This is why this NetEnt Casino recently updated its welcome offer to a 121% welcome bonus of up to €300!! Additionally, there are two weekly bonuses available as well. On Mondays and Tuesdays, you can enjoy a Wild Reload bonus of 21% up to €210 while the Stairway Bonus provides you with up to 50 bonus spins for four of the most popular NetEnt slots. I wish providing information about online casino promotions was as important for 21 Casino as its customer support seems to be with a 24/7 support. It’s not hard to find out that this aspect receives a lot of attention from this NetEnt Casino giving customers the choice between email and a live chat. Frequently Asked Questions can be found on the support page while I can see that it might be in the near future all game rules will be available as well. Just as any other NetEnt Casino, also 21 Casino appreciates loyalty, the reason it set up a loyalty program for its players. 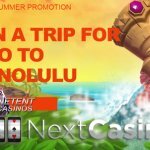 Stick with this refreshing NetEnt Casino and you’ll be rewarded with loads of special offers and loyalty points that can be accumulated and redeemed for cash or merchandise. Of course, all standard deposit options are available at 21 Casino such as VISA, MasterCard, Maestro, Ukash, POLi, Neteller, Paysafecard and Skrill. I wish I could tell you more about the withdraw options at this NetEnt Casino, but unfortunately, I’m missing out on some transparency again and a deposit information page. 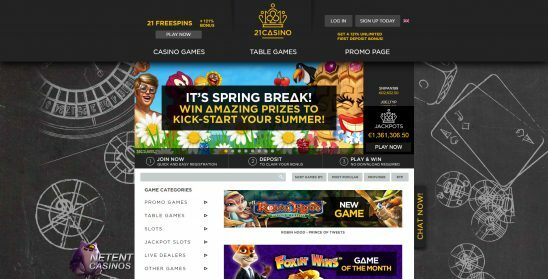 I truly like 21 Casino’s design, well-organised casino platform, a wide range of online casino games. Active in the market since 2015, this online casino established itself very well and has been granted three of the most important casino licenses in Malta, Great-Britain and in Sweden! It wasn’t that long ago that this NetEnt Casino had its grand opening, but ever since they really took care of small issues and the casino experience only got better.